Imverse, an EPFL spinoff, has developed a software that lets users convert 360-degree images from 2-D into 3-D and both manipulate and create virtual-reality content in real time with the help of virtual-reality glasses. The system will be unveiled at the World VR Forum in Crans-Montana, Switzerland, from 11 to 14 May. 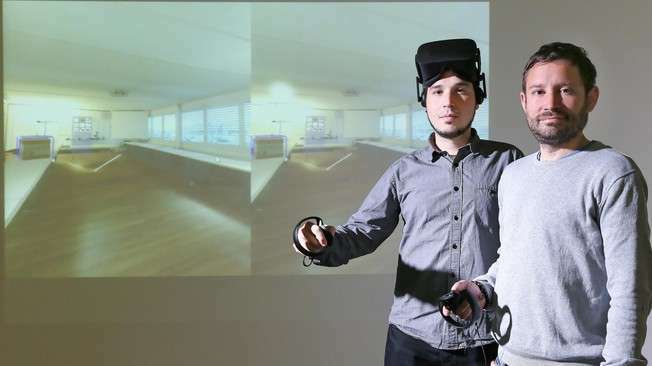 It's now easier than ever to create a 3-D environment and then add and manipulate virtual-reality content in real time, thanks to the software created by EPFL startup Imverse. What's required? A 360-degree 2-D photo taken with any commercial camera, and a pair of off-the-shelf virtual-reality glasses. The software is similar to photo editing software allowing the users to freely explore and modify the environment created from the picture in real time. Imverse's software delivers professional results and has a wide range of potential uses. Javier Bello Ruiz, the CEO of Imverse, which got its start at Campus Biotech Innovation Park, is initially targeting virtual-reality studios that work with real-estate agencies, advertisers and the media. "Take a real-estate agent who wants to sell a house that's in need of a little work. The seller could show a prospective buyer the end result by modeling the house in 3-D using a 360-degree photo and then modifying the interior in real time – even collaboratively together inside the virtual environment – suggesting various options that the buyer could tweak freely using the virtual-reality glasses." The program is so simple that even non-experts can use it, and licenses will be available early next year. "Just like with photo editing software, all you need is a little training to begin developing interactive content," said Javier. This will save users significant time and money. The underlying technology was developed in part at the lab run by Olaf Blanke, the director of the Center for Neuroprosthetics located at Campus Biotech. The software will soon be tested by potential customers and will be presented this week at the World VR Forum in Crans-Montana. "Switzerland is known for its cutting-edge technology, and the Lake Geneva region has an excellent virtual-reality ecosystem. So we're hopeful that we'll meet potential customers and partners and stir up interest among investors," Javier added. The project engineers are already at work on the next step: full immersion of a user's body so that the user can interact with the virtual environment in real time. Javier hopes that his company's application will quickly become the software of choice for developing mixed-reality content.